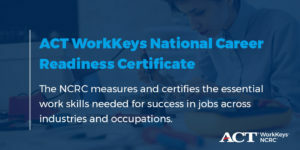 Have you been hearing the buzz lately about the ACT® WorkKeys assessment and the National Career Readiness Certificate and are interested in learning more about how it can help you save time and money in hiring, recruitment and training? Well this Lunch and Learn is your chance to learn more and ask questions of members of the North Louisiana Ready2Work team, who have been trained by ACT to talk you through the process. There is no charge to attend and lunch will be provided, but registration is required as we have a limited number of seats available. Click the Register button above to reserve your seat today. If you cannot attend this Lunch and Learn, we will be offering others over the coming months at various locations in Bossier, Caddo, DeSoto and Webster parishes. Check out this calendar of events, or register for the North Louisiana Ready2Work newsletter by clicking here.